A Little Brush—Mails—Daring Expedition—How it Began and Ended. 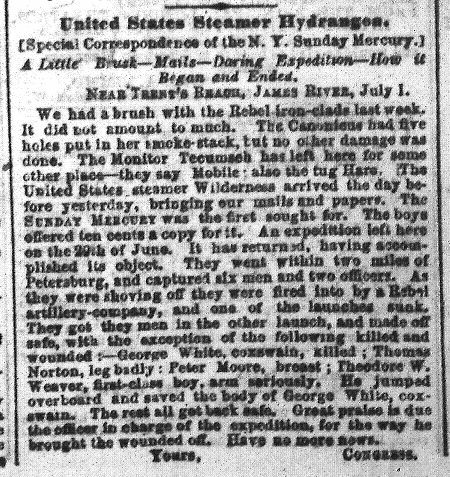 We had a brush with the Rebel iron-clads last week [on June 21, 1864 at Howlett’s Bluff]. It did not amount to much. The Canonicus had five holes put in her smoke-stack, but no other damage was done.1 The Monitor Tecumseh has left here for some other place—they say Mobile; also the tug Hare. The United States steamer Wilderness arrived the day before yesterday, bringing our mails and papers. The SUNDAY MERCURY was the first sought for. The boys offered ten cents a copy for it. An expedition left here on the 29th of June . It has returned, having accomplished its object. They went within two miles of Petersburg, and captured six men and two officers. As they were shoving off they were fired into by a Rebel artillery company, and one of the launches sunk. They got they [sic] men in the other launch, and made off safe with the exception of the following killed and wounded:—George White, coxswain, killed; Thomas Norton, leg badly; Peter Moore, breast; Theodore W. Weaver, first class boy, arm seriously. He jumped overboard and saved the body of George White, coxswain. The rest all got back safe. Great praise is due the officer in charge of the expedition, for the way he brought the wounded off.2 Have no more news.